In this featured spot, Lateef Johnson, Co-Owner of FIT Austin shares his insight into how and why his business has become the go-to studio in his market. AFS: Tell the audience about how FIT Austin is different from your competition? LJ: A husband and wife team with over 20 years of professional experience we have designed a movement-based fitness experience. At FIT Austin, we specialize in injury prevention, body composition change (fat loss! ), nutrition, mobility, stability and athletic performance. A 360-degree approach to fitness. Focusing on movement, not muscle – we approach your fitness, exercise and wellness program to Optimize your Health Creating a safe, fun and informative experience for everyone. FIT Austin is where you get results. AFS: Describe your training philosophy? LJ: FIT Austin, a boutique training studio features the best-in-class training programs and equipment. Our signature class, Optimize 45, welcomes everyone from beginners to elite athletes with challenging but doable 45 minutes training classes - it's functional training at it's finest! The class incorporates exercises that push, pull, rotate, squat, hinge, crawl, plank, and lunge...we like to say, "Movement is what Matters. Move Better, Feel Better, Perform Better, Look Better." Additionally, we offer diverse, progressive workouts that keep sessions fresh and engaging while helping members improve every aspect of their fitness. Our small group training program provides our members with plenty of attention from our coaches in ensuring their success. In the end, we focus on your quality of movement not just your level of output. AFS: What are you "only's? Meaning, you are the only studio that does...? LJ: Our "only" is tied to our equipment. We feature Matrix equipment including the S-Drive, the Matrix Rower, and Connexus. In addition, we are the leaders in Austin with several functional training tools including TRX (Suspension Training, Rip Trainer and the Duo Trainer), ActivMotion Bar, Dynamax Medicine Balls, Equalizers and HyperWear Sandbells. AFS: What do you do on a daily basis to create "post-worthy experiences" on social media and spread your brand awareness? LJ: We do our absolute best to keep our social media fresh and engaging. We like to post to our Instagram stories or feed what the daily training plan is and highlight the purpose behind doing it. We also do our best to showcase the fun and exciting happenings such as featuring members and staff with a story to share. AFS: Why did you decide Matrix was the right equipment manufacturer for your studio? LJ: After working with another fitness equipment functional system we realized that we got it wrong. The company didn't offer any support. And the equipment was a space hog. With Matrix, it was the complete opposite. Support from the beginning, equipment that delivers and programming that keeps things fresh for my members. I wish I had a time machine to go back and do things right the first time! With Matrix, it was the complete opposite. Support from the beginning, equipment that delivers and programming that keeps things fresh for my members. I wish I had a time machine to go back and do things right the first time! AFS: What equipment did you purchase from Matrix and how is it integrated into your programming and training style? LJ: We purchased the Connexus, an extremely versatile, multi attachment point framing system that allows us the ability to provide more with less space - we absolutely love it! We also purchased the accessory package and two newly re-designed rowers. For us, it's important to have the best that's out there to provide our members with a training experience (on high-quality equipment) that's unmatched in our area. AFS: Tell us about the experience your members can expect to receive and some special WOW factors that make you stand out in your community. LJ: Quality of movement is what we focus on. Any workout can make you tired and sweaty we train so that you can Optimize in 45. We create a culture within our studio that gets people talking. The environment is also conducive to those with busy schedules to get in, get an amazing workout, and get out -- so they can get more done throughout the day. AFS: What advice do you have for other studio owners or those aspiring fitpros looking to go into business for themselves? LJ: What equipment you purchase matters. Availability of program design resources matter. When you have the best equipment and the best programming support then your opportunity to be successful dramatically increases. AFS Members Receive Special Pricing from Matrix! 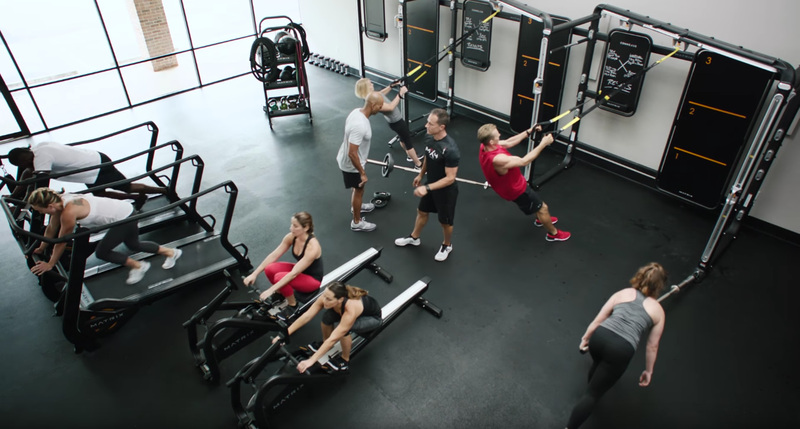 Find out more about the MX4 Small Group Training System (pictured below) and other Matrix equipment for your studio or gym!